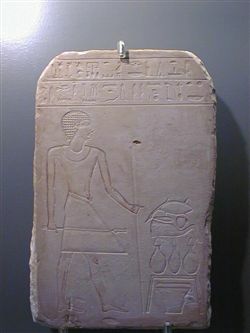 The stela is rectangular. The top corners are slightly rounded, but this is probably due to wear. The representation is executed in bas-relief. The left side features a standing male figure, facing right and wearing a short curly wig, a simple broad necklace and a triangular protruding kilt. The left hand holds a long staff, the right hand a sceptre. On the offering-table in front of him are three sealed jars, a shin of beef, a piece of fowl and two more pieces of meat. Under the offering-table is a basin with a cloth over it. The text is in two horizontal lines above the scene. (2) and all good and pure things, to the revered Intef, borne by Ini.